Spending more time per day fetching water increased Indian women’s risk of delivering a low birth weight baby, a study has said. Open defecation and using a shared latrine within a woman’s building or compound were also associated with higher odds of low birth weight and pre-term births, respectively, compared to having a private household toilet. The researchers believe that improving water, sanitation and health access and/or reducing gender-based harassment could reduce these adverse birth outcomes. Another study pointed out that enhanced access to a reliable and proximate water supply reduced the time spent by women in collecting water and the proportion of hard labour performed by women. In addition, the thus freed may be spent on other income generating activities. The study by University of Iowa College of Public Health published online in October highlights the relationship between adverse birth outcomes and sanitation access, domestic water fetching, crime and gender-based harassment. Among women without a household water source, two hours was the median time women trekked to collect water, the study reported. It suggests physical and psychosocial stress are possible mechanisms by which water, sanitation and hygiene (WASH) access affects pre-term births (PTB) and low birth weight (LBW) among Indian women. “What we think is most likely is that carrying heavy loads of water requires a lot of calories, and that many women aren’t consuming enough healthy food during pregnancy to sustain the micronutrient needs to grow a healthy baby,” said Kelly Baker, assistant professor of occupational and environmental health, who co-authored the study. Pregnant women need to consume 300 extra food calories per day of nutritious food during pregnancy to give the foetus adequate nutrition. “Recent studies have linked maternal malnutrition to low infant birth weight, and our study is suggesting a mechanism for why pregnant women may be malnourished,” Baker told Mongabay-India. United Nation’s Sustainable Development Goal target 6.1 calls for universal and equitable access to safe and affordable drinking water. In 2010, the UN General Assembly explicitly recognised the human right to water and sanitation. The State of the World’s Water Report 2018 reveals that in India nearly 163.1 million people lack access to clean water close to home, despite the country being world’s most-improved nations for reaching the most people with clean water. India is reeling under problems of falling groundwater levels, drought, demand from agriculture and industry, pollution and poor water resource management – challenges that will intensify as climate change contributes to more extreme weather shocks, the report said. At the same time, India also faces a daunting task to achieve the Sustainable Development Goals of bringing neonatal mortality from the current level of 25 to 12 per 1,000 live births and under five mortality rate from 43 to 25 per 1,000 live births by 2030. Spending more time per day fetching water increased Indian women’s risk of delivering a low birth weight baby, a study has said. Photo by Kartik Chandramouli/Mongabay-India. The present study contributes to the limited evidence related to environmental causes of PTB and LBW by demonstrating that lack of household WASH infrastructure and social factors, like crime and harassment of women and girls, are risk factors for adverse birth outcomes in women in low- and middle-income countries, the researchers write. The researchers culled data from the India Human Development Survey. The survey asked women about their drinking water source, walking time to that source, time spent fetching water, sanitation (toilet) access, harassment of women and girls and local crime among other queries. They examined the effect of pre-birth WASH and social conditions on self-reported PTB status and LBW status for 7,926 women who gave birth between 2004 to 2005 and 2011 to 2012. Of these women, 14.9 percent experienced premature birth and 15.5 percent delivered a low birth weight baby. Baker goes on to say that one of the most important limitations in their study was reliance upon self-reported behaviours, experiences, and birth outcomes, which may have been prone to response bias. Also, the amount of information collected about WASH and social capital was limited. 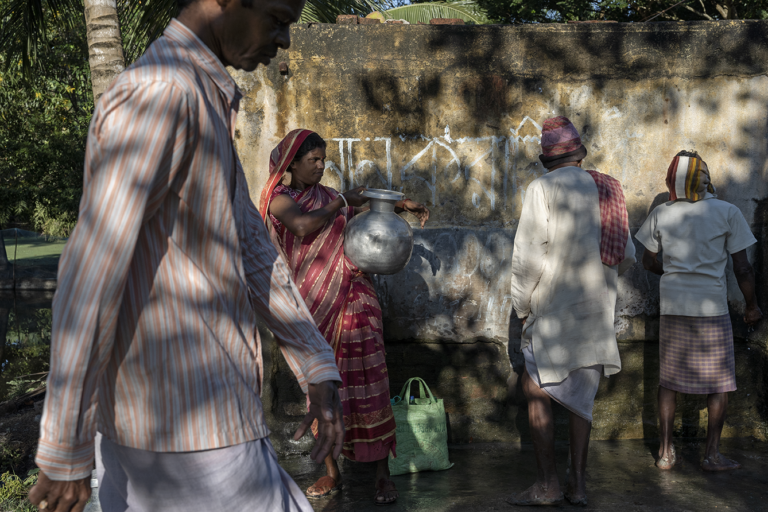 In November, India restructured its National Rural Drinking Water Programme with a goal to reach 90 percent of rural households with piped water by 2022. As per government data, only 56.3 percent of the rural population has piped water supply. In India, a ground-water dependent nation, drinking water security of nearly a billion Indians is at potential risk on account of the county’s groundwater crisis. At least 85 percent of the rural population relies on groundwater for their daily drinking water needs and nearly 50 percent of the urban share of water supply is groundwater-based. Western Sydney University’s Basant Maheshwari who works on sustainable groundwater use and management observed women also make substantial use of groundwater for productive purposes. 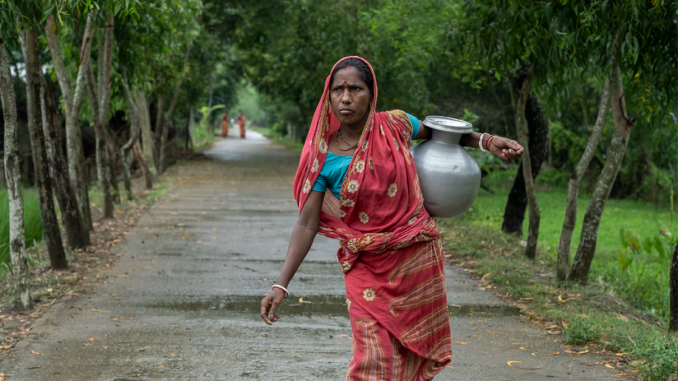 In most developing countries, like India, the trend is that women are responsible for household water collection and water use and management, including promoting hygiene within the household and community. 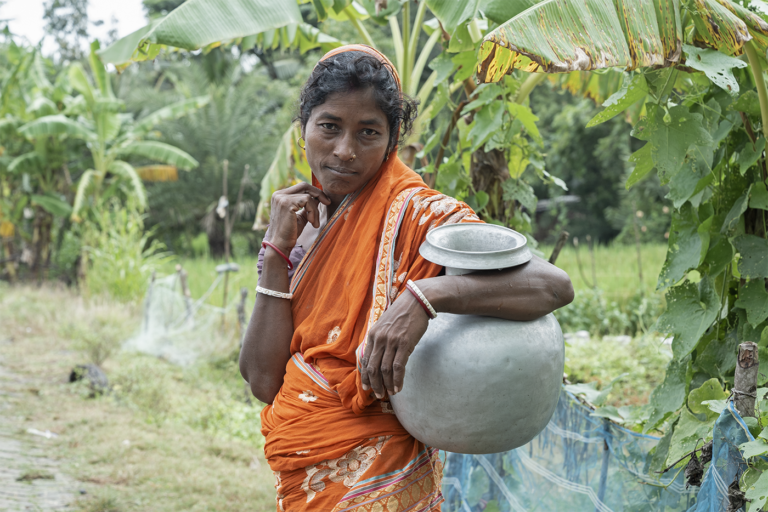 On the other hand, men are perceived to be responsible for productive water use and management such as the running of farms or small businesses even though women are very much involved in productive water use as well, explained Maheshwari. Women also make substantial use of groundwater for productive purposes. Photo by Kartik Chandramouli/Mongabay-India. Despite women’s significant role in water use and household management, women’s needs and uses of water are not often represented in water resource management policies or projects, according to a 2017 study co-authored by Maheshwari which looked at the gendered roles and responsibilities of water usage and collection in two watersheds of rural India. Analysis of surveys across Meghraj watershed in Aravalli district, Gujarat and the Dharta watershed in Udaipur district, Rajasthan located in India revealed that enhanced access to a reliable and proximate water supply reduces the time spent by women in collecting water and the proportion of hard labour performed by women. In addition, freed time may be spent on other income generating activities. Women interviewed indicated improved water access translated as diversified livelihood activities that increase their income earning potential and help strengthen their bargaining position. The results confirm that a large number of women continue to travel many times a day to collect water for various uses. Women travelled an average of three times in a day for 50–77 minutes per trip to collect drinking water, depending on the season. The responsibility of collecting water for drinking, domestic and livestock use also means girls are late to school or end up missing school altogether. Further, the outcome highlighted the need for planners and policy decision makers to recognise the diverse roles that women play in groundwater use and management. Although women are actively participating in non-government organisations and water management executive committees, their influence in the decision making process is perceived by most women as not on par as their men counterparts. “Thus, the recognition of women’s multiple needs will not only strengthen their individual bargaining position in the inter- and intra-household arena but also within the community,” the study said. Maheshwari believes that if water is easily accessible, women will not have to walk long distances to meet their families’ water needs. “This will allow them to save their time and energy and devote the saved time and energy to their family and their own rest and wellbeing. This will definitely help in improving their health. If they are healthy, their babies will be naturally born healthy,” he said. Baker underscored the need for health practitioners and policymakers to address environmental factors like WASH access for a variety of beneficial reasons. “But, they also need to consider policies that improve gender dynamics and social relationships related to sharing communal resources. We believe that improving WASH access and/or reducing gender-based harassment could reduce these adverse birth outcomes; however, this theory remains untested,” she said. “Based upon our findings, on-plot access to water should theoretically reduce the amount of physical exhaustion or musculoskeletal injury and psychosocial violence or harassment that pregnant women experience,” said Baker. “But, it does not address the root causes of domestic labour related to water use. One clear outcome of our study was that crime and gender-based harassment were consistently associated with PTB and LBW,” she said. Even if women gain access to household water, they might still need to navigate stressful social conditions to purchase food, for example, or to address personal bodily needs. “We think increasing access to household water is necessary for women to have healthy pregnancies, but it is not sufficient so long as gender-based harassment and violence continues,” she said. Open defecation and using a shared latrine within a woman’s building or compound were also associated with higher odds of LBW and PTB, respectively, compared to having a private household toilet, the University of Iowa study said. “Open defecation could be linked to birth outcomes through several mechanisms, including increased risk of infectious diseases that cause inflammation and immune deficiency, psychosocial stress, physical strain, or injury,” Baker said. The relationship between shared sanitation and preterm birth is unclear, but the researchers hypothesised that it might be due to the social relationships that must be forged among women sharing latrines with neighbours to collectively manage those resources. The association could also be due to conditions that were not measured during the study. The researchers hope to further explore the mechanisms explaining associations. For the time being, one clear policy step would be to include indicators for monitoring gender-based water fetching and community-level gender-based violence and harassment in national surveys, and better link such indicators to maternal and child health outcomes.